A few weeks before this year's E3 kicked off we caught a quick glimpse of Far Cry 4's cover art, followed by a decent chunk of gameplay footage courtesy of yesterday's press events. 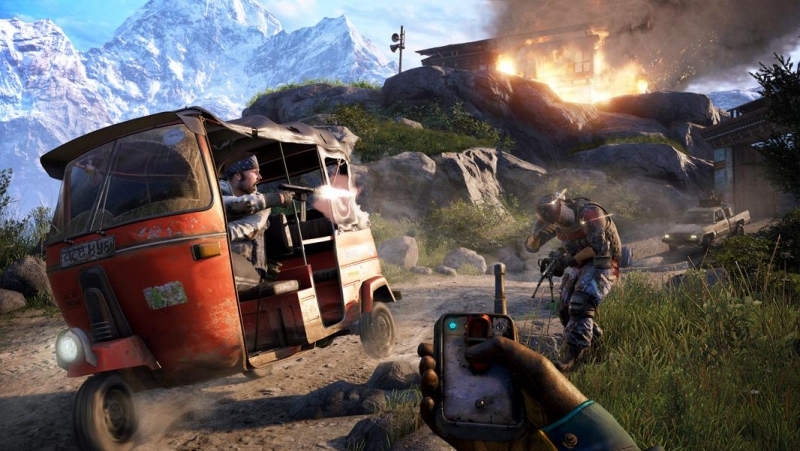 During the gameplay demo, we presumably saw Ubi's "Guns-for-Hire" co-op mode in action, allowing you and a friend to take on the civil war torn region of Kyrat together. But even more interesting, Sony VP of developer relations Adam Boyes said during the presentation that users playing the game on PSN will be able to invite friends to play with them even if those friends don't own a copy of the game. Those who purchase Far Cry 4 on PS3 or PS4 will get what Ubisoft is calling the "Keys to Kryat." According to the official PlayStation blog, the "keys open up Kryat’s borders to any of your PSN friends, inviting them into your open world even if they don’t yet have a copy of the game." The blog post goes on to say that with the Keys to Kryat players will be able to capture outposts and traverse Kryat together, which sounds more or less similar to the regular "Guns for Hire" co-op mode. At this point there are no details on exactly how this is being made possible, but it could be something to do with PlayStation Now. There is also no details on how many PSN friends someone who purchases the game can share the co-op experience with. The feature is exclusive to PlayStation and, as some have suggested, it could very well sway gamers on which platform to purchase the upcoming title for.